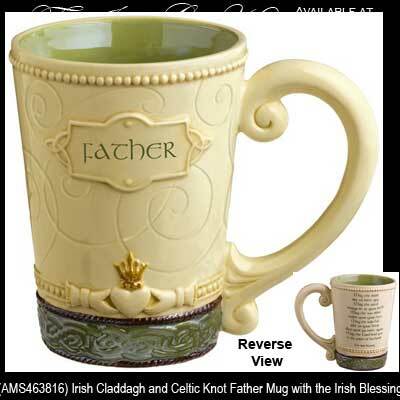 This Irish coffee mug for father features a blessing along with the Claddagh and Celtic knot-work. Dad will love this Irish coffee mug that is designed just for him. The Irish coffee cup features Father along with the Claddagh and a Celtic motif on the front, and the Irish blessing on the reverse. The Irish Father's coffee cup measures 4 3/4" wide x 5" tall and it holds 13 ounces of your favorite beverage.